Laura van den Berg read from her debut novel Find Me at McNally Jackson Books. 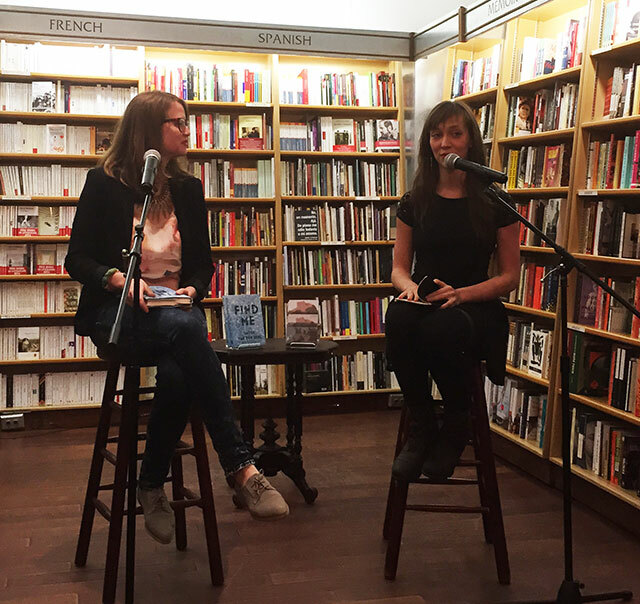 She was joined in conversation by Catherine Lacey, author of Nobody is Ever Missing. Find Me is a semi-dystopian novel about a mysterious disease afflicting the United States. The main symptoms are silvery scales on the face, memory loss and death. Protagonist Joy has shown resistance to the disease, and she along with a hundred and forty-nine other patients have been secluded in a hospital for observation and ostensibly, to search for a cure. The second half of the novel is a road trip like journey across the nation. For all the claustrophobia of the first half of the novel, the second half is wide open, both in possibility and in action. “My favorite fiction is kind of freaky,” van den Berg says. She explains that Joy is someone who is drifting through life, often high on cough syrup. Van den Berg needed a cataclysmic event like a plague to impact Joy. “It took something that big to strip down her walls,” she says. Lacey turns the conversation to Florida. Van den Berg is from the state, and Florida serves as a destination in the novel Find Me. “Why is Florida so fucked up?” Lacey asks. “I cannot explain the state of Florida,” van den Berg offers, saying that the state transcends any explanation. Though there are only a few pages in the novel dedicated to the state, it remains an important part of van den Berg’s creativity. “Florida is my foremost influence,” she says. Florida is a surreal place, van den Berg says, and that surrealism is reflected in her writing. Consider the alligator hotline. Growing up, she lived near a small body of water, which inevitably meant that alligators would show up from time to time, at which point calling the alligator hotline was a necessity. She describes living there as having daily contact with surrealism, and that once she left, she found normalcy to be strange. For Find Me, the narrative developed along with an architecture to it–the two part storyline involving an enclosed place of the hospital and the wide open possibility of life on the road. That structure lent itself to a longer story and eventually lead to a novel draft. The first draft of Find Me was completed in about six months, back in 2008. Van den Berg says she wrote it straight through beginning to end, but that meant there were a lot of problems that needed correcting later. Almost nothing of that first draft still exists in the final novel seven years later. Van den Berg says she can write stories anywhere–on the subway, in a bathroom at a party. But novels are very different. Most of the work on this novel was completed while at residencies. Daily life is too distracting, she says, to really feel into a novel. “A novel–it wants your life,” she says. The novel opens with Joy watching pilgrims outside her hospital window. The pilgrims flock to the hospital to worship or experience or just to know what is happening with the people contained within. Van den Berg says she started the novel this way to help drive action in what was an otherwise static situation: confinement to the hospital. Action feels more natural to van den Berg, and so once Joy escaped the confinement of the hospital, writing seemed easier. But contained in a small space with limited choices offered more of a challenge. Joy is often characterized by the lists she creates in the narrative. This character trait began because van den Berg was making lists to help define the parameters of the character, and ultimately its a quality she and Joy share: “I”m a list-er myself,” she says. There were numerous drafts, a half-dozen major revisions, and countless smaller updates, van den Berg says. She will sometimes totally rewrite her work from nothing. She finally knew the book was finished when Joy arrived at the place van den Berg had seen her going. “Every book is a representation of the best we can do in that moment,” she says.